Home BOLLYWOOD Snapped: Kareena Kapoor Khan Sans Make Up! Snapped: Kareena Kapoor Khan Sans Make Up! [tps_footer]Kareena Kapoor Khan is rightly termed as the most gorgeous actress of B-Town. The glamorous diva who is always glowing with radiant skin is also a numero one when it comes to her strict fitness regime. The fashion icon is currently busy with the promotions of her upcoming film ‘Ki and Ka’. After a long gap, Kareena will be seen in a full-fledged role in a movie. The highly talented actress who is selectively active on social networking sites recently made everyone drool with a post on the photo sharing app Instagram. 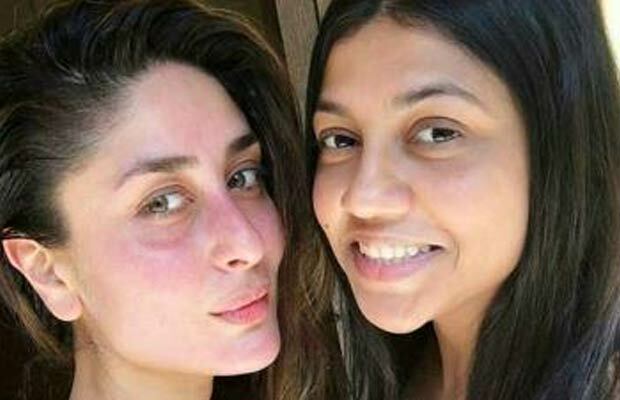 The Bajrangi Bhaijaan actress is seen with her fitness trainer in the picture with a no make-up look. Looking all worked up and tired, one cannot get enough of Kareena’s pink cheeks. The mind blowing diva has always been everyone’s favorite when it comes to beautiful looks. After donning the silver screen for brief glimpses, the diva will now flaunt her acting skills in R Balki’s ‘Ki and Ka’ opposite actor Arjun Kapoor. Kareena and Arjun Kapoor’s chemistry in the trailer of the film has already received an applaud from the audiences. The songs of the film are on the chartbusters. With such a unique star cast the movie was much anticipated since its inception. ‘Ki and Ka’ will bring a unique concept in the film industry with its never seen before plot of house husbands. Kareena Kapoor will be seen playing the role of working woman whereas Arjun will play a house husband! Previous articlePhotos: Alia Bhatt And Ranveer Singh Turn Mysterious! Next articleCaught: Malaika Arora Khan Hides From Paparazzi While On Dinner With Besties!